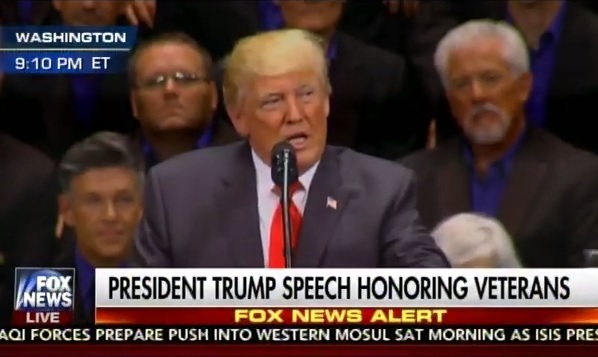 President Donald Trump honored Harry F. Miller today during his speech at the annual Freedom Concert in Washington DC. Harry was just 15 when he joined the US military during World War II. Harry lied about his age to join the American forces. Harry was a US hero at The Battle of the Bulge. During the battle, the 1st Army Headquarters instructed the tank crews to go down to an ordnance depot and take whatever they needed for the tanks. “We had to take good parts off of one tank and put it on another. We finally got three tanks and a tank destroyer that would operate and run, and had a gun,” he said in an interview with VA. They took the three working tanks and sent them to their C Company. Those three tanks ended up taking out three German tanks, which ended up being members of the 1st SS Panzer Division Leibstandarte SS Adolf Hitlerbeing, Hitler’s old body guards. On Saturday night President Trump honored Harry F. Miller for his great sacrifice for our country.